Breaking news! The stock market is crashing! Everybody panic! Unicorns are going to die!!! Today’s brouhaha did, nonetheless, give additional fuel to the ‘We’re in a bubble!’ fire – and especially the notion that there are going to be some dead Unicorns really soon. Noted Doomicorn enthusiast Bill Gurley had plenty to say about this, and without a doubt some of today’s lunch discussions in the tech world revolved around that nagging question – which $1B+ tech companies will die, and when? And what about the first Decacorn – the fabled $10B+ companies? I certainly feel that, bubble or no, we’re going to see one or two of these fabled companies go under at some point no matter what. No matter what the state of market frothiness or investor panic, the rate at which things change in the tech world is so fast that there’s really no way that every big, private tech company could survive being outcompeted, disrupted, or flat out made irrelevant for too long. I don’t care how much innovation and hustle they have in their collective C-suites; at some point, some of them are going to come to a sudden, shocking realization that… they just don’t matter any more. The horror! The big question is inevitably – as Lenin asked – Who, Whom? Who’s gonna die, and at whose hands? A startup’s greatest fear initially isn’t competition from others – it’s simply the worry of being ignored and irrelevant. Past a certain stage of growth, and now you’re worried about your competitors – what if they can built it better, cheaper, faster, stronger? At yet another point, though (I’d argue around the $1B valuation mark) your peers aren’t your biggest concern anymore. If you’re worth a billion dollars, you’re probably doing enough things well that your direct competitors can’t take you to the cleaners overnight. Instead, your nightmares shift to a fate even scarier than being outcompeted: being eclipsed. Specifically, being eclipsed by someone at one level of the stack above or below you. What does this look like in practice? It’s what Microsoft did to the PC manufacturers, and then what the web browser did to Microsoft. It’s what Android/iOS did to the handset makers, and what Facebook is trying to do to them in turn. To those being eclipsed, it’s terrifying because the change happens so gradually and then so suddenly: Compaq was one of the best PC makers around until all of a sudden Windows was what mattered, not the machine it ran on. Then a bit later on, Windows ruled the world and Microsoft was King- but all the interesting stuff started happening inside the web browser. My point being: Compaq didn’t get creamed because somebody else came along and made a better desktop PC. They lost because all of a sudden Windows was what was important- and other PC Manufacturers like Dell were better suited to thrive in the new reality of modular commodity. I preface my unicorn prediction with all of this to emphasize once again – when billion dollar tech companies die, it usually isn’t at the hands of their direct competitors. It’s simply because they go from one day being the best at what they do, to the next day being still the best at what they do except it doesn’t matter. When these companies are really big – i.e. in the $10B+ Decacorn range – it matters. So who will be the first Decacorn to fall? My bet is Dropbox. But not – as has been the worry for years – because of Google Drive, or Skydrive, or any cloud-hosted file storage solutions at all. As we’ve seen before, it isn’t your direct competitors that are the scariest. Dropbox will die at the hands of Slack. You might think that a communication and workflow tool such as Slack would be a great compliment to a storage and version control service like Dropbox – and you’d be right. But as Slack rises rapidly through the tech scene and beyond into the outside world, they and others like them are changing the very requirements of our work itself. As Benedict Evans writes succinctly, new tools start out being made to fit existing workflows, but over time the workflows evolve to take full advantage of the tools. Referring to the ubiquitous Internal Presentation full of company metrics and bullet points circulated around countless departments by email each day, he muses: “That powerpoint file could be replaced by a web app for making slides that lets two people work on it at once. But it should be replaced by a SaaS dashboard with realtime data, alerts for unexpected changes and a chat channel or Slack integration. Powerpoint gets killed by things that aren’t presentations at all.” So that’s great for Slack, but why the pessimism towards Dropbox specifically? Dropbox does two things that matter: storing your stuff, and sharing your stuff. It’s great at both. But storage on its own isn’t a great business to be in anymore – the cost of hard drive space in the cloud has all but converged to zero over the last few years, in a furious race to the bottom driven by Amazon’s infrastructure and Google’s reach. Yet Dropbox has survived, not because it offers the cheapest or the most storage but because its file sharing and versioning tools are still pretty darn good. And they recognize that syncing files isn’t enough – providing services and experiences around that core function, they say, should do the trick. But Dropbox’s big existential problem isn’t how well it can deliver services around file management: Dropbox’s problem is the fact that it’s a great file management service – we just don’t care about files that much any more. 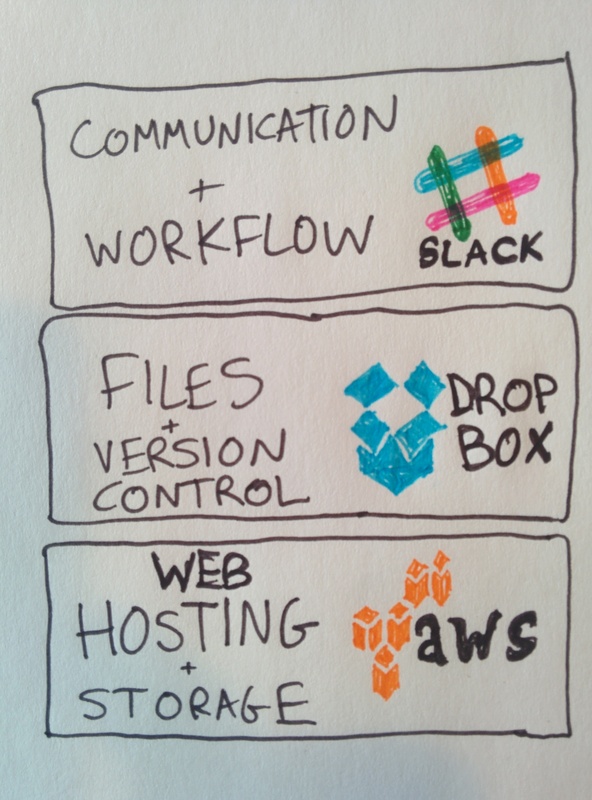 Dropbox, in many ways, represents the perfect final form of that old and venerable office presence: the file system. In ‘the old days’, offices were outfitted with stacks of cabinets for storage, copy machines for duplication, and internal mail departments (sometimes with awesome pneumatic tubes) for transmission. Then computers came along, and naturally we organized our stuff the same way we always had: through virtual files and folders (with icons that even looked like the real thing). When you’re getting used to new technology, some familiarity never hurts. Then we adopted email en masse, and sent our files with cumbersome attachments that were always too big. Then the cloud came along, and with it came the promise that all our files cloud live forever, in the cloud, accessible by everyone, always, in perfect synchrony. So what’s the problem? The problem for Dropbox is that our work habits are evolving to make better use of what’s available; specifically, the awesome power of the internet. And on the internet, the concept of a ‘file’ is a little weird if you stop and think about it. Files seem woefully old-fashioned when you consider organization tools like Evernote, task management tools like Trello, and communication channels like Slack. Files are discrete objects that exist in a physical place; the internet is … pretty much the opposite of that. And while it made sense that the birth and early growth of information and the internet would contain familiar, old-school ideas and organizing systems, and some point the other shoe was bound to drop. To me, Slack feels like the first truly internet and mobile-native productivity platform – especially as it expands beyond messaging and into workflow automation, helper bots, and who knows what else. 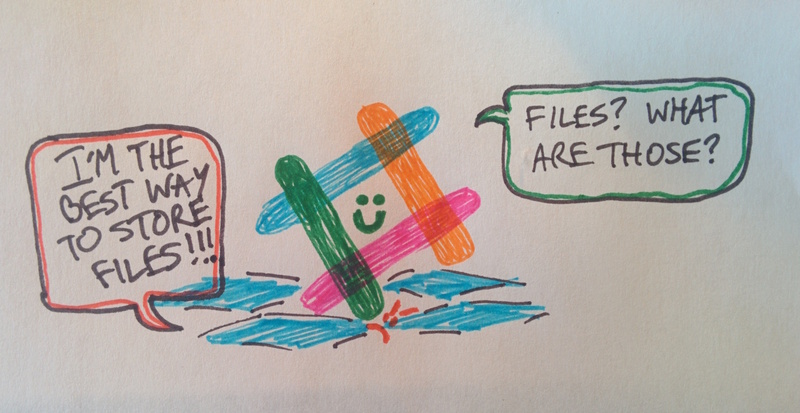 Dropbox might be the pinnacle of file management, but Slack is the beginning of what comes next. I don’t think files are going to completely disappear; not anytime soon, anyway. They’ll certainly still exist as data structures, deep inside our servers and our phones, for a very long time – and yet most people will be indifferent to their existence. I’m pretty sure Dropbox’s multi-billion dollar valuation isn’t an anticipation of this new reality – it’s simply a projection of our current world, played in fast-forward. This is gravely shortsighted. Dropbox may not be the first Unicorn to slide slowly and then quickly towards irrelevance and death – but it’ll happen. And with it, we’ll finally put to rest an aging, useful and stately way of doing things – the humble file – that shall have lived a long and dignified life. doesn’t this argument assume that dropbox does nothing over the years (decades?) it will take for the file to slowly fade into obsolescence and as slack continues to encroach on its territory. i would guess that dropbox, with its $400M in current rev and 400M current user base, 1,000+ employees / developers will vigorously defend its territory and build new products to navigate an ever-changing tech landscape. there’s tech companies that are far less innovative that have survived longer. kudos to the author for putting out a bold statement (in a world where most ppl hedge their bets), but i respectfully disagree / think the logic is flawed. If Dropbox is able to keep up what they’ve been doing while keeping one foot in the future, it’s entirely possible they’ll make it through, and more power to them. They’d be well deserving. Thanks for the comment; I appreciate the feedback! perhaps our disagreement might mostly be semantic or stylistic. if the title (and contents) of this article were, “Dropbox, a decacorn that could be challenged in the future by up and coming unicorn Slack”, then I think that’d be a less controversial version of your argument — albeit not as interesting (and not as click-baity) as predicting the demise of a decacorn. i also think the article is a bit flippant about how incredibly difficult it is to build a company with 400M users, over $1B in funding, over 1K employees — in a world where AOL still generates over $1B in EBITDA, I think predicting the demise of a far more innovative company is difficult to believe (if you gave some sort of argument for why Dropbox is like Fab — ie. completely unsustainable business model, that might’ve been more believable). in summary, i think the main problem i have with the article and your comment is that it speaks in absolutes: “Dropbox may not be the first Unicorn to slide slowly and then quickly towards irrelevance and death – but it’ll happen”, which I find extremely dangerous in a field as fluid as technology. The smartest people I know always speak in probabilities, because no one really knows what’s going to happen, we’re all just guessing. I totally agree with your point that the illustrative points of the article are written very much in absolute – and you’re right that in reality, everything is a probability. Of course it’s not an absolute (or even probable) certainty that this will play out exactly as I’ve described. However, I definitely found it easier to make my point using literal examples rather than fuzzy probabilities – and, writing-wise, I’ve typically stray on the edge of more strongly-worded declarations that bring out the underlying points more forcefully, even if they themselves are a bit over the top – after all, it’s really the underlying point that I care about communicating, not the specific details of how I think it’ll play out. Thanks for reading and for the feedback! alex — re: your last point, kudos again on putting out something that has caused a lot of discussion — that in itself IMO is a victory. as mentioned maybe i got a bit too hung up on style or semantics. time will tell if your thesis is correct of course! I actually believe her logic is correct even though you make a great point. The reason I feel her logic still holds given your point is “inertia”–for lack of a better term. DropBox KNOWS storage. Their company started very, very focused on that idea, and they hired around that idea, formed a business model around that idea, and had to be extremely and singularly focused on that idea. Communications, collaboration and workflow is a different idea. A company that has achieved so much success focused on one simple thing is not necessary suited to build different things–even in response to a threat to its survival. DropBox attempting to become good at collaboration, communication, and workflow is a lot like Michael Jordan trying to play baseball. It usually does not work out. From Compaq to Windows, handset makers to Android/iOS and now Dropbox to Slack. I’m seeing less reliance from small to medium sized companies I send files to. I’m a Photographer and I’d prefer sending my folders of images via P2P but I have to take spect clients working practices. I only send final revisions and inform that the link will only be available for a week. This saves my space in Dropbox. I’m moving some clients successfully to Infinit which is a P2P cloudless and better encrypted, 26x times faster too. But as you can guess these are tech savvy companies. You’re right about workflows, whoever simplifies it wins. Certainly correct, but my best guess is that Microsoft is also tacking sharply in this direction. Xdrive, drivespace … Sych a chord? And then why only dropbox? On the contrary dropbox is far more useful (photo storage) thwn Box which has more to worry. With Amazon storage , why invest into Box at all? Having led Box deployment for global entwrprise , I can confidently state Box is waste of dollars invested but CIO’s receiving gifts (?) get away justifying use case to what is consudered least priority to invest time by business execs. Let me get this clear. You’re arguing that the concept of files – which have been around pretty much since writing was invented – will be supplanted by unstructured stream-oriented communications, and the crux of the argument is “specifically, the awesome power of the internet”. Did I read that right? Most mobile apps are data prisons affording reduced utility. I don’t see this as an advance. Now I see the origin of your consequential sophistry: confusing the subversion of a visual metaphor for the obliteration of the underlying paradigm. I disagree with this prognosis. The idea that corporate employees are going to abandon Excel, PPT, Word and PDF because they can create dashboards in Slack or store docs in there is a very naive argument. People’s use habits around these document forms have built up over decades. The vast majority of most company employees (many in the Boomer, GenX and even Millenial ranks) are specialized in creating their necessary knowledge work here. To call out DropBox for failure is glib and reckless in my opinion. Yes Slack is a very compelling collaboration tool with an amazing trajectory, but to tie that to DropBox’s death is laughable. Dropbox is fundamentally a B2C business and unlike Box, not really invested into attacking the Enterprise, happy that individuals simply make a decision. The market for this type of product is measured in the hundreds of million. Dropbox today is a significant business and profitable. The fact that it works, can’t be overstated enough, most of their competitors don’t work as well. Slack is clear a B2B play, it was pitched as a “be all, end all” type of product. In my own usage, it’s a glorified Instant Messaging client and expensive at that. Industry noise is that while Slack has continued to grow, it’s not growing nearly as fast as previously and in fact, Hipchat is winning customers back who’ve realized, despite some of Hipchat’s self inflicted wounds, that the product has enterprise functionality they need. As a betting man, I’d say that unless Slack steps up their game, the bloom will be off. A unicorn no more.